I swear, I'm not becoming a maniacal travel-runner. I'm not going to try to run a race in all 50 states and on all 7 continents. I promise I won't pull a Forest Gump and run clear across the country, and if I do, I promise to have a better reason than "I just felt like it." Actually, I probably wouldn't have a better reason that that. I'd probably say I was doing it for bacon research or something. "Hey! We just had one of our American Odyssey Relay runners drop out for a work conflict, and the race is in 2 weeks!!! I know how you love last minute adventures and running so any chance you want to come play with us?" So do I want to join a team of 12 people that will run 198 miles from Gettysburg, PA to DC, run a half-marathon distance for my part whether its cold or rainy or the middle of the night, get little to no sleep for about 36 hours, and ride around (when not running) in a van that we've all stunk up from our running funk? Hell yes. I have no idea what I'm doing, but YES. 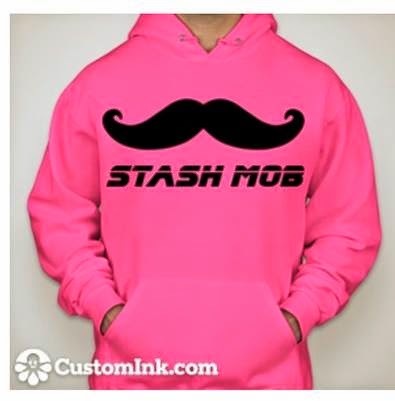 So I am now the 12th member of Team Stash Mob. I've been to Gettysburg just once. It's a beautiful and fascinating place. The drive there was lovely (there was no traffic when I went), but you don't see all that much from a highway. This time, I won't get to see anything in Gettysburg itself, but I'll get to experience the in-between in an entirely different way. This time the destination really is about the journey itself, and on top of that, I get to experience it with 11 awesome people. And that's going to be pretty sweet. Exhausting and stinky, but sweet. And we will all be sporting hot pink sweatshirts with giant mustaches on them. That's pretty sweet, too. Thanks! I'm so excited about this! !